Facebook has finally released some user FRIENDLY features for page admins today! Let’s get right into it. When you go into your page admin area (click on “edit page” at the top of your page’s admin panel), you’ll see that where it used to say “manage admins,” now it says “Admin Roles.” Click on this and you’ll see your existing admins. You can modify their roles, if you wish, and you can add new admins and assign them permissions as well. 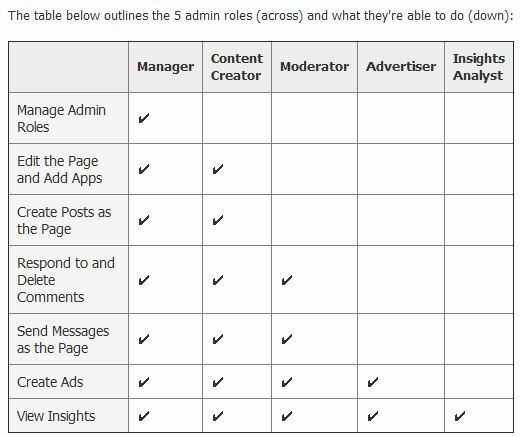 Here is a chart of the new user roles (thanks to Mashable.com) and what they are allowed to do. If you want people to have complete control over the page, just leave them as “Manager.” This is what all your existing admins will default to. Likewise, if you want to schedule posts to go out in the future, you can do that, too. Say you’re going to take the weekend off and go to Las Vegas (hilarious, I know), but you want to make sure that you’re posting regularly over the weekend about your upcoming Fur Ball. Now you can schedule those posts before you hit the strip, and not have to worry about it all weekend! You can schedule a post up to 6 months in advance in 15-minute intervals. Click on the little clock to set when you’d like your post to appear. (If you don’t choose a time, it will just post immediately, like it always has). Please note: Just because you CAN schedule posts in the future, please use this feature wisely. What happens when we are allowed to “automate” our social media is that it becomes a one-way broadcast, and no interaction. If you’re playing in Las Vegas, and your Facebook page is pumping out posts all weekend, that’s great–but what happens if your fans respond, comment, or have questions? Nobody is REALLY there to answer them. And that makes for bad customer service, which results in lower engagement and just general bad social media juju. So really only use these features if you absolutely have to. If you are having trouble with either of these, just post here and we’ll get you straightened out! Sorry I didn’t have news about the timeline becoming optional…I know that’s what a lot of you would have liked to hear!! ← Facebook Secret: Only 3% – 7% of your Facebook Fans are seeing your Fan Page Posts!